Teen Reach, founded in 2000, is committed to starting programs that bring hope and a brighter future to at-risk youth who usually reside in the state or private foster system. Camps and mentoring programs are spreading across the nation and globe, and now exist in seventeen states, the Philippines, and South Africa. Teen Reach Adventure Camp (T.R.A.C.) is a three-day separate-gender camp for teens, ages 12 to 16. At T.R.A.C., every activity is geared to teenagers having fun and being safe. Every teen receives a Bible, and their beliefs and story are respected. There is a challenge course, where they learn how to trust others and overcome challenges by working as a team. All volunteers are thoroughly screened and camps are kept small, so the youth feel connected and safe. T.R.A.C.life is a mentoring program for teens who participate in T.R.A.C. It is a vehicle to keep a special relationship that was started at camp going all year long. Mentoring relationships have been proven to change the direction of youth who are at risk. For more information, see the Teen Reach website. Samaritan's Purse helps to meet the emergency needs of Christians who have been terrorized or driven from their homes and farms. Your gift of any amount will help them to provide food, shelter, and other assistance to those who are being persecuted. To support this cause, The Works of Geroge MacDonald has teamed up with WisePath Books to offer Arise, featuring the magnificent music of Barbara Amell, and including a song based on MacDonald's poem, Who Would Have Thought? There is no known cure for ALS (Lou Gehrig's Disease), but with your help, we can change the future. ALSTDI, the world's first and largest nonprofit biotech focused 100 percent on ALS research, actively discovers and develops treatments for ALS. Led by people living with ALS and their families, they understand the urgent need to slow and stop this disease. 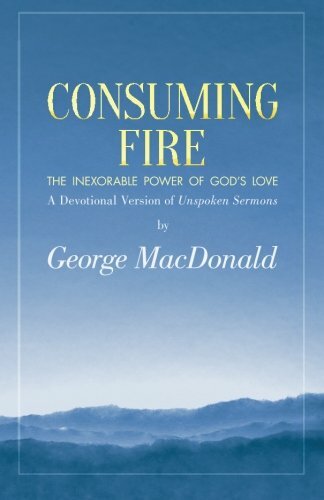 100% of royalties from sales of "Consuming Fire"—the devotional version of George MacDonald's Unspoken Sermons—go to ALSTDI.